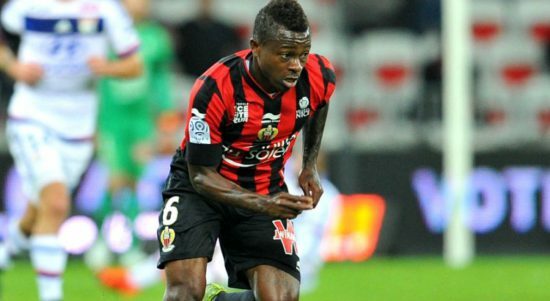 Manchester United are reportedly growing confident of signing Nice Midfielder, Jean Michael Seri ahead of a potential summer move. The Ivorian international was heavily linked with a move to the Nou Camp last summer but the deal failed to materialise as the Catalan giants decided to pull plug on the deal having signed Brazilian midfielder, Paulinho from Chinese side, Guanzhou Evergrande. However, reports from English publication the Daily Mirror understand that Manchester United are front-runners to sign the midfielder with Jose Mourinho keen on bolstering his midfield options in the summer. The Special One recently revealed the Reds Devils are in the hunt for a central midfielder in the summer with club captain, Michael Carrick set to retire at the end of the season. Although, it is believed the Ivorian has a release clause of £35 million and could be the subject of a three-way transfer battle between Manchester United, Chelsea and Liverpool also interested in signing the midfielder with both clubs keen on bolstering their squad in the summer. The 26-year-old began has grown into one of the finest midfielders in the Ligue 1 since he secured a move to French side, Nice from Portuguese club, Pacos de Ferreira for a reported fee of €1 million. He is often deployed as a central midfielder and he is known for his flair, passing, long shots, dribbling, creativity, vision and also a set-piece specialist. The former Porto midfielder has featured in 25 games for OG Nice across all competitions scoring once and providing four assists.